Sorry, I just had to get that out of the way. People paid to read my book!!!! Twenty-Eight and a Half Wishes is my third book. None of you will read the first, a manuscript chained to a post in the dungeon of my external hard drive. I should do the humane thing and press the delete button, but my silly pride prevents me from following through. My second book, Chosen, will be published in September. So why did I publish this one first? Several reasons. 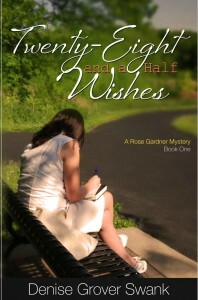 Twenty-Eight and a Half Wishes is the most like my blog There’s Always Room for One More out of any of my books. It’s light-hearted, funny, but bittersweet in a non-whiny way. (I hope anyway!) Rose Gardner, the twenty-four year old main character, has spent her life under her mother’s rule, living a life of ridicule and an alienation, yet you won’t find her wallowing in self-pity. She’s a pragmatic girl who just accepted her life as it was. Until she sees a vision of herself dead. And she suddenly begins to question her life and her situation. She decides, yes, her Momma treats her like a child, ordering her around, but Rose allowed her to do it. Rose realizes she is in control. She’s always held the power to make her life into what she wants. I love that about her. She could easily blame her problems on other people– her Momma, the people in her town of Henryetta, Arkansas, but she doesn’t. Instead of playing the victim, she accepts responsibility for her own life and choices. Rose makes a list of twenty-eight things she wants to do before she dies, or later before she gets arrested for her mother’s murder. Why twenty-eight? She makes the list in the park and the only paper she can find is a Walmart receipt. That’s all the room she has. No one really knows this, but the list comes from my own personal life. When my husband died five and a half years ago, I reevaluated everything in my life. There’s nothing like the undeniable proof of mortality to make you realize you’re not going to live forever. (Rose says this nearly word for word in the book.) I didn’t make an actual list. They just rattled around in my head. But I knew that life was about living, not sitting around and waiting to pass you by. So it seems fitting that the inspiration to fulfill my life long goal and then inspired part of Twenty-Eight and a Half Wishes, should be the first book I published. I won’t say I always follow my own advice/revelation. I still need to stop every once and awhile and take stock. Where am I? Am I happy where I’m at? Today, I can honestly say that I am. I can’t tell you how excited I am about this!!! Love Rose…LOVE YOU!!! CONGRATULATIONS!!! Thank you, Dorothy! And thank you so much for interviewing me again! I knew this day would come. I’m just happy to be a part of it! Congratulations.